A lot has changed since then, but predictions still play a key role in our decision-making processes. Today, we live in an era of predictions that impact the evolution of our civilization and the accoutrements that go with that including our day-to-day business activities. Wikipedia points out that a prediction can also be referred to as a forecast. In other words, a prediction is a future-looking result or sign based on historical data. These days, enterprises are using AI and machine learning to generate predictions and use them in business flows. Basically, predictive analytics is used to fill in the missing pieces of the data puzzle by building more understanding of the data that is available. Why are predictions important when making business decisions? With predictive analytics, businesses can take their knowledge of their customers to the next level and anticipate wants and needs. Companies that approach decision-making based on data trends and analysis tend to treat information as a defined asset compared to companies with other approaches. These companies use analytics to more easily identify business opportunities and predict future trends and strive to generate more revenue with data. What is important to consider when thinking about predictions? We mentioned that predictions are calculated based on historical data. It’s important that this historical data is a true representation of what actually happened. Let’s say you want to predict the estimated travel time from point A to point B. You rely on a dataset, which tells you that on Mondays and Fridays the trip took 20 minutes, on Tuesdays 30 minutes, and on Wednesdays and Thursdays 25 minutes. So, you might think it’d be safe to say that if you travel over the weekend the trip would take around 25 minutes. This might be totally wrong. Over the weekend, the same route is not congested and it could actually take less than 10 minutes. Similarly, it’s important to know the business context when predicting the outcome of a variable. What if the data doesn’t look good? How do you fix it? First off, get to know your existing data. 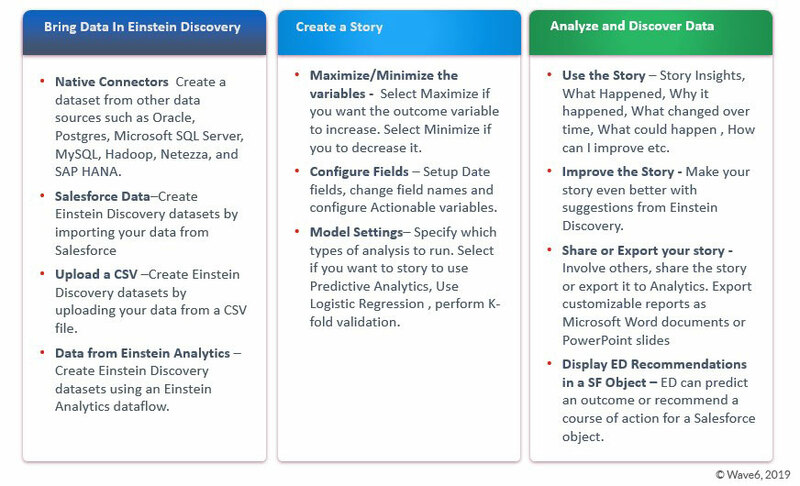 Einstein Analytics (EA) can help uncover key data problems. EA allows you to augment (join) Salesforce objects (and external data as well) so you can get a better understanding of the many relationships among data objects. EA faceting makes your job easier by drilling down and across so that you don’t have to worry about specific roll-up fields. You can perform a thorough analysis by looking at those dimensions or attributes that would help predict the outcome of a variable. 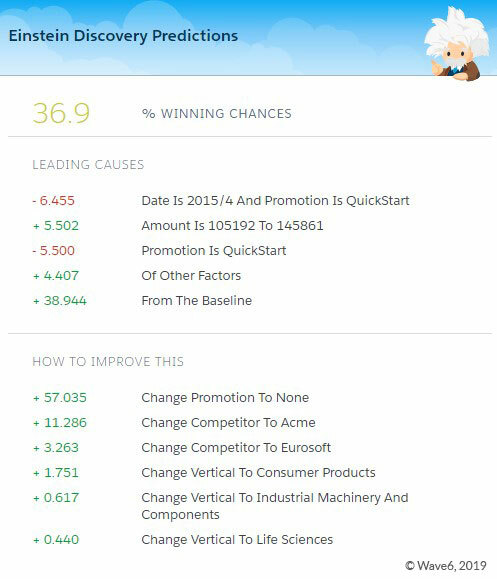 Why should you use Salesforce Einstein Analytics and Einstein Discovery? If you are a Salesforce User, the Einstein platform is your best bet for enabling predictions. The self-service analytics app of Salesforce includes an ETL (extract, transform, load) tool that allows you to read not only from Salesforce objects but from many other platforms, such as AWS, Azure, Google Cloud, and even from CSV files using simple connectors. Einstein Discovery (ED) then consumes data from a dataset created by EA through a seamless integration on the same platform. Finally, predictions coming out of Einstein Discovery can easily be embedded in Salesforce Lightning pages, so that you don’t have to navigate to other apps or websites. How can you make the best use of EA + ED licenses (EA Plus)? Einstein Analytics is a collection of tools that embeds predictive and analytical charts for its Sales, Service, and Marketing clouds. Einstein Discovery is a platform that provides actionable data and insights to the stories. These tools are designed to bring artificial intelligence to business executives while providing the underlying data models to more advanced users like data scientists. What is this thing about stories? Maximize or minimize? Every story includes a desired goal of maximizing or minimizing an outcome. For example, a goal could be to maximize the margin or to minimize the per-unit cost. You can deploy multiple models to the same goal. You would take this approach to segment your data into different models (one per segment) that target the same goal. What is the writeback feature and how can it help Salesforce users? How can integrating in Salesforce make more sense? What’s the advantage of Lightning Integration? Writeback is a feature where the explanation, recommendations, and predictions created from a story in ED can be applied to a new record being created in Salesforce. Imagine how cool it would be for a sales rep to see these statistics for, let's say, an opportunity created by them and then being able to predict the outcome of the opportunity. This feature allows us to show all of this information as a separate section within the Lightning page layout of a Salesforce record. To top this, these are real-time numbers that get calculated based on the story created in Einstein Discovery. The rep can see them as soon as they create the record. These predictions give key insights to the rep and help them understand how that record may play out in the future, offering assistance and providing recommendations to help achieve the desired goal: closing deals. Remember that the story works on the principle of setting a goal for maximizing or minimizing an outcome. Consider an example where you need to predict the outcome of an Opportunity. Wouldn’t it be great if you could predict the percentage chance of winning it? To get analysis and predictions around this, a story can be created in ED by selecting the ‘is Won’ field in the Opportunity to be true. Remember that a story can make use of a variable to be maximized or minimized, but at the same time you can configure it as a Boolean value such as true or false (as in this case). This story can then be deployed to Salesforce and the results can be viewed for the individual Opportunity record that is created or updated. Please see the snapshot below, which shows the writeback feature embedded in a Salesforce detail page record.